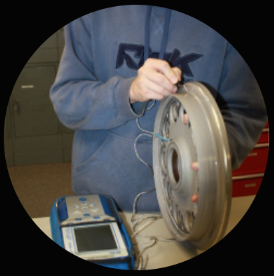 The eddy current method is primarily used to detect surface defects in electrically conductive materials. Defects can also be checked to a certain depth. The method is based on the action of an alternating magnetic field on the product being tested. The coil then induces an alternating voltage in the product. The metal product being checked becomes a closed current conductor in which so-called eddy currents are generated.